Manufacturer of a wide range of products which include water level sensor and magnetic float level sensor. Having a definite quality management system, we are regarded as the noteworthy manufacturer and supplier of Water Level Sensor that is used in water tank for sensing the level of the water and motor will gets ON or OFF accordingly. Our provided water level sensor is developed by highly skilled professionals using finest grade raw material & latest technology keeping in sync with the norms of industry. Offered water level sensor is stringently tested on various parameters in order to deliver defect free range. Electronic Switches ( I ) P. Ltd; offers range of Magnetic Float Switches. These are mainly available for Single Level Sensing and Two Level Sensing type. Magnetic Float Switch contacts are SHORT when float is at lowermost level and OPEN when float moves up (towards fixing). As per the level of liquid, float position changes and corresponding output is used for automation Control Unit is also available for automatic functioning of Pump or Feeder with supply 220 volts AC and offers relay output. Relay is ON when level of liquid reaches lower level and gets OFF when level of liquid reaches upper level. This can be used for further interlock for automatic functioning of system. Control Units also offers audio or visual alarms. Supply Voltage : 10-24 Volts DC or AC Controller : Available with 230V AC Output : SHORT when level is sensed otherwise OPEN No of level : Single / Two Level Output Current : 100 mA max Stem Mounting : Stainless Steel Float : PU Foam / SS Float Working Temp. : Up to 55 Degree Centigrade. 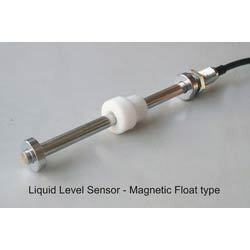 Our organization has successfully expanded its business in market owing to the offered elevated quality array of Magnetic Float Level Sensor that is used for sensing the level of liquid in storage tanks, reservoirs, hoppers, and is perfect for automatic pump control, audio and visual alarms, & safety interlocks. The offered float level sensor can be used for further interlock for automatic functioning of system. In addition, our float level sensor is mainly available for Single Level Sensing and Two Level Sensing type.